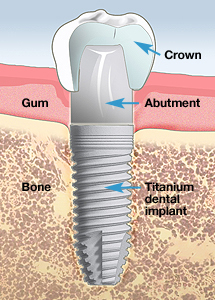 A dental implant is a replacement tooth root made of a small titanium post that is surgically anchored into the jaw. A dental implant is a cylindrical and/or tapered post, usually made of titanium, that serves as a substitute for the tooth root. A connector, known as an abutment, is placed on, or built into, the top of the dental implant, to connect the implant to the replacement tooth or teeth. Finally, a crown, a replacement tooth, is custom made to match your natural teeth, completing the dental implant. Learn more..
Why would I need a dental implant? If you lose a tooth as a result of an accident, tooth decay, root canal failure, or gum disease, your dentist may recommend a dental implant and an artificial replacement tooth (a crown or cap). Dental implants also may serve as secure anchors for a bridge or dentures if you have multiple missing teeth. Your dentist, who should be a credentialed dental implant expert, will place the implant into the jawbone. As you heal, your implant will fuse with your natural jawbone. Once the implant bonds with the jawbone, a small connector is placed on top of the dental implant to connect the implant to the replacement tooth or teeth. Dental implants are stronger and more durable than dentures or a bridge. They offer a permanent solution to tooth loss. In the case of multiple missing teeth, dental implants may be used to support a dental bridge or with dentures to increase stability and reduce gum irritation. Dental implants, whether used in combination with dentures or a bridge or on their own, make it easier to eat the foods you love, speak clearly, and smile with confidence. What can happen if I don’t replace a missing tooth? When you don’t replace a missing tooth, it can result in damage to adjacent teeth by causing gum recession and bone loss around those teeth. It can cause your other teeth to wear prematurely. You may experience difficulty eating and speaking, shifting teeth, jaw aches, and headaches. Also, when you lose a tooth and its accompanying root, you can experience bone loss in your jaw. A dental implant gives the bone purpose, providing it with something to hold onto. If a great deal of time has passed since the tooth came out and too much bone in the jaw has been lost, grafting may be necessary to increase bone mass before an implant procedure can be done. What is the success rate for dental implant surgery? Overall, the success rate for healthy patients who receive dental implants is high—from 92–98%. However, patients who are over age 72, who smoke, or who have a history of diabetes or head and neck radiation, or who are postmenopausal and on hormone replacement therapy, may carry a higher risk of implant failure as compared with healthy patients. During your initial consultation, your Emory oral and maxillofacial surgeon will review your medical history thoroughly. This will allow him to determine whether dental implants are right for you.